Following the departure of long-time writer Ed Brubaker, Rick Remender took over Captain America and moved it in a completely different direction for the title’s Marvel Now! re-launch. Brubaker, who elevated Marvel’s super soldier Steve Rogers to new heights of popularity during his eight-year run, created part superhero adventure, part international spy thriller, taking a more grounded look at the character by initially emphasizing the soldier over the super. 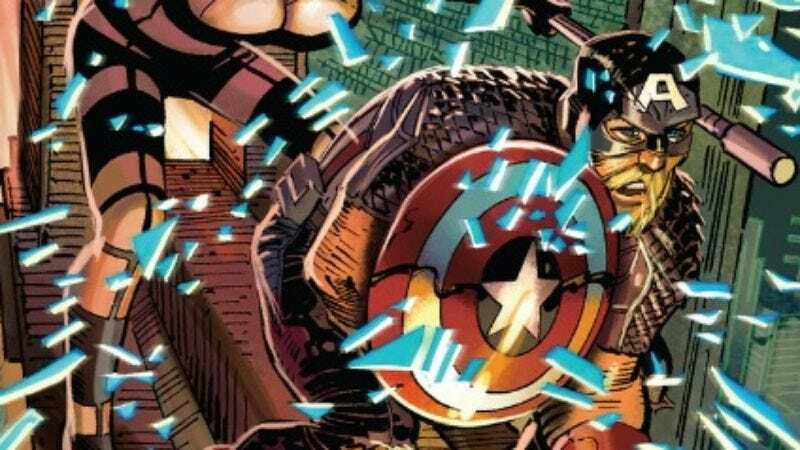 Remender pulls Steve Rogers out of that familiar environment and throws him into a dystopian alternate dimension ruled by Arnim Zola, a Nazi scientist whose consciousness lives on in a robotic body. With the help of artist John Romita Jr., inkers Scott Hanna, Klaus Janson, and Tom Palmer, and colorist Dean White, Remender has distanced this title from Brubaker’s run while continuing the character development started by his predecessor. The biggest change in direction hasn’t come from the sci-fi setting, but from the new responsibility taken on by Steve when he steals one of Zola’s test tube children. During his 12 years in Dimension Z, Steve raises Ian Zola as his own son, fighting to be the kind of father that his own failed to be. The book was finding its footing during the first few issues, but once time started jumping forward, the story took off as Remender juggled superhero action, sci-fi world-building, psychological horror, and historical fiction in each chapter. The narrative purpose of the flashbacks to Steve’s childhood during the Great Depression becomes clear as he struggles to raise his son in an even bleaker environment, and the focus on Ian’s relationship with his father has turned the title into a hybrid of The Road and Jack Kirby’s 1970s Captain America run. It’s been a hellish nine issues for the title character, who has been trying to keep Ian alive in a world of bloodthirsty Mutates while housing a piece of Zola’s consciousness within his own chest, which turns Steve Rogers’ body into a battleground between two conflicting paternal ideologies. After being taken from Steve, brainwashed by his creator, and forced to fight his adopted father, Ian was seemingly shot dead by Sharon Carter at the end of #8. Steve’s only been away from his home dimension for 30 minutes, so how could his fiancée have known she was taking out his closest living relative? As Steve deals with the emotional trauma of losing his son and the physical trauma of cutting Zola out of his body, he teams with Sharon and Zola’s daughter Jet Black to stop the invasion of Earth by Dimension Z Mutates, taking even more devastating hits as he makes his daring escape in Captain America #10. It’s an incredible conclusion to a story that has made a major impact on the character’s status quo, setting the stage for the future of Remender’s run and establishing how it will be different from what came before. The writer addresses some heavy material in his script, but it’s all balanced by exhilarating action sequences that exhibit the boundless energy of those old Kirby comics. Kirby showed how action and emotion could be heightened with more expressive, exaggerated comic book artwork, and those principles are evident in John Romita Jr.’s dynamic breakdowns for this issue. Working with the all-star lineup of Hanna, Palmer, and Janson on finishes, Romita Jr. captures the grandiose scale of the final battle in Dimension Z, which builds to an epic confrontation with a skyscraper-sized Arnim Zola. There’s no discernible different between the three finishers, who all add weight and detail to Romita Jr.’s layouts while maintaining a smooth sense of motion. There’s a more distinct shift from Dean White to Rachelle Rosenberg’s coloring, but those pages take place on Earth, creating a natural reason for the change in coloring. (Rosenberg may have contributed to some of Dimension Z sequences, but it’s hard to tell.) Dean White has been an integral part of keeping a cohesive visual style as Romita Jr. takes on more inkers, and his digitally painted colors heavily contribute to the texture of the artwork. He does masterful work with special effects like smoke and fire—the reveal of giant Zola is particularly stunning—and he gives Romita Jr.’s art remarkable depth while heightening its exuberant power. The battle ends with Sharon sacrificing herself to destroy Zola and his mobile fortress, and while it’s doubtful she’s actually dead, her actions deliver another painful blow to Steve. He returns to Earth a broken man, now even further removed from a world he already felt alienated in. According to Remender’s comments in the letters page, Steve has spent more time in Dimension Z than Earth’s present, which creates an intriguing new dynamic between the hero and the world he’s sworn to protect. Marvel’s sliding timeline will give you a headache if you think about it too hard, but the timing details don’t really matter. What’s important is that Steve’s experience in Dimension Z has made him feel like a stranger in his natural environment, returning to the “man out of time” theme that has characterized Captain America since the Avengers revived him. Luckily, he won’t have to deal with this transition completely alone. The similarly grieving Jet Black, who is mourning a brother and father while Steve mourns his son and fiancée, joins him on Earth. Remender leaves a plethora of plot threads to explore at the end of this story, including the reveal that Ian is not only alive, but has taken on the role of Dimension Z’s protector under the name of Nomad. The lack of a body immediately cast doubt on Ian’s demise, and it’s nice to see that Remender is committed to keeping Ian and Steve’s relationship an essential part of the title. Considering the absence of Sharon’s body, it’s likely she’s also alive somewhere in Dimension Z, which hopefully means a team-up between Ian and the woman who shot him further down the line. The book moves from its sci-fi direction as artist Carlos Pacheco joins the team next issue, but embracing a pulpier tone for the first arc has allowed Remender to create a distinct story that has major ramifications for the character moving forward. It’s hard to make a status quo change on a long-standing hero feel important, but Captain America has had great luck in that regard over the past 10 years. The reveal of Bucky as the Winter Soldier made a lasting impact during Brubaker’s run, and Steve’s experience in Dimension Z has laid impressive groundwork for a captivating run by Rick Remender as the writer prepares to move into more traditional superhero territory.